Two primary organizing concepts have shaped the new school. 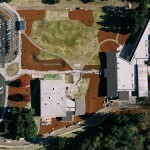 Federal Way Public Schools superintendent, Tom Murphy inspired the first key design concept when he articulated his vision of “A School in the Park”. The second concept, “Focus on Student Learning”, is a school district guiding principle and summarizes the essence of why we build schools. Lakota Park and Middle School grounds occupy land adjacent to an ancient kettle lake left by the Vashon Glaciations that shaped the Puget Sound region 15,000 years ago. 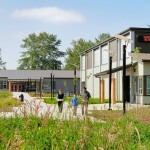 Alongside the walk to the school entrance, the Meadow serves as a buffer, providing access while separating the school from the urban environment and the active park uses. The building steps down to meet the wetland and is visually protected from the streets and public park by the sloping topography, the building, and the adjacent grove of trees. 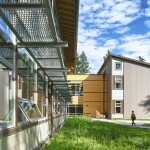 The south facing classrooms of the new school hug the riparian edge of the wetland, giving students prospect over the watery landscape. 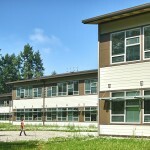 Planting (both coniferous and deciduous trees) throughout the school grounds reinforces the park-like feel of the site, re-establishes the native forest, and helps articulate grade changes and the layering of outdoor spaces. Vehicular traffic is relegated to the northern edge of the site. Gated service drives and fire loops to the east and west of the school provide easy access for maintenance and security. The learning communities are composed of eight classrooms, two laboratory/studio spaces, a Great Room; several “flex” areas accommodating activities ranging from informal learning to distributed library functions, team resource areas, conference rooms, seminar rooms, distributed toilets and storage. The varied spaces of the Small Learning Communities support opportunities for exploratory and integrated curricular models. 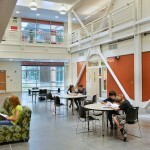 The adjacency of the Great Room to classrooms, labs, studios and planning spaces supports multiple curricular approaches, including project based learning. The physical expression of the District’s goal of flexibility was to develop a flexible and adaptable structure that can change to support evolving teaching and learning methods. The basic structural system is a steel frame with non-bearing interior partitions, which allows repositioning of the interior walls to create varied spaces. Laboratories and studios are designed to accommodate numerous functions such as: science, art, career and technology options (production shop, computer lab, food preparation, business lab, etc). 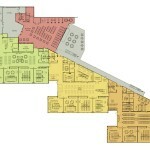 The Great Room is convertible to support numerous activities. 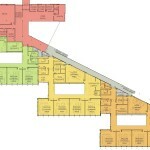 Administration, library, and Resource Center are combined into a multivalent student service area. The organization of the school into Small Learning Communities, the provision of teacher prep areas in each cluster, small study nooks, and the potential for distributed administration functions supports the collaborative goals of the district. Community partnerships are at the heart of the new school planning. 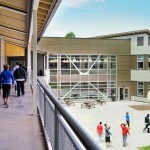 The school design enhances the adjacent public park by locating the field house with its performing arts and physical education spaces invitingly near the park. External spaces such as The Meadow, The Green and the riparian edge add spatial variety to the park’s existing outdoor recreational areas. Safety and security are achieved through clear sightlines that encourage supervision throughout the site and the interior spaces. Pedestrian paths are separated from vehicular routes. The parent drop-off zone is separated from the bus drop-off. Open interiors with numerous relites provide passive visual and acoustic supervision on multiple levels. Discreet small learning neighborhoods ensure that students and teacher alike will be known and will know who is coming into their space. 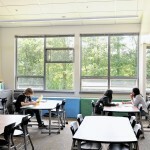 The new school is designed to meet and exceed the requirements of the Washington Sustainable School Protocol. Features include daylit learning spaces, efficient mechanical and electrical systems, healthy indoor environments, use of renewable and recycled materials, efficient use of water, and protection and enhancement of the adjacent wetland. 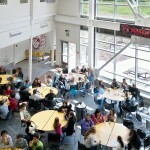 In addition to the school’s site and building planning, Lakota Middle School is designed to protect the environment and conserve resources in ways both visible and subtle. Electricity is generated by the 39kW thin-film solar array on the building roof and rain shelter. Light-sensitive controllers dim electric lights to take advantage of the natural light provided by windows, clerestories, and skylights. Sprayed polyurethane foam is installed in the exterior walls. Individual modulating furnaces are provided for each learning. 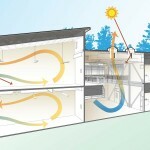 Combined efficiency measures are predicted to reduce energy use 50% below Washington State energy code requirements. Over 95% of the project’s demolition and construction debris was recycled or salvaged. The new footprint of the new school covers about 45% less area than the original campus, increasing site open space and storm water absorption. Storm water from roofs and parking areas is cleaned and released into the wetland in a way that mimics natural wetland recharge. Potable water use is 30% below baseline due to low-flow fixtures and by limiting permanent landscape irrigation to minimum City requirements. Nearly an acre of restoration planting enhances the wetland and defines the transition zone to the developed portion of the site. 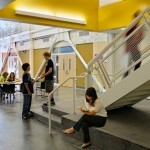 Images and description courtesy of Bassetti Architects. PA & PM work completed by Brian Rich at Bassetti Architects.